Before the early '60s, the family entertainment center was built like a piece of furniture. It was generally the size of a small sofa and had the television, record player and speaker all built in. Occasionally there was a compartment on the side for storing the family's collection of long-playing records. Somewhere between Frank Sinatra and the British Invasion, records and record players got smaller and record buyers got younger. Teenagers wanted to carry their collections to friend's bedrooms for listening sessions. The time was ripe for the creation of record carrying cases or "totes." There are a wide array of case styles. The earliest examples are made of tin or steel. Later totes are made of vinyl (washable!) or plastic. The square cases hold the records properly, standing on edge. The round cases store them improperly, flatly and on top of one another. Disk-Go-Cases (also referred to as Disc-Go-Cases) are the most common of all of the '60s-'70s era cases. They were cylinder shaped with a tell-tale white triangular handle. The standard cases were made of plastic and came in hot pink, turquoise and harvest gold. There are some examples with simple patterns. 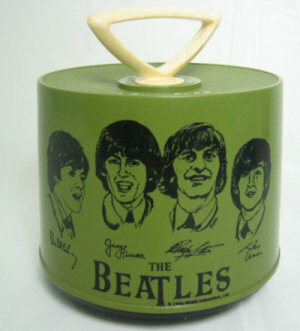 The most sought-after cases features illustrations of The Beatles. These came in harvest gold, avacado green and bright red. The normal cases will set you back about $10 while The Beatles case regularly brings $100 or more for a good example. Tote-45 cases are similar to the Disk-Gos but have a black T-shaped handle. The Platter-Pak cases (Amberg File & Index Co.) were square and held both 45s and LPs. The cases from the '70s are very colorful, usually decorated with an opt-art or psychedelic pattern, polka dots etc. The Supercase Record And Toy Carrying Case featured color illustrations of D.C. Comics characters Batman, Robin the Boy Wonder, The Joker, Wonder Woman, Cat Woman, Supergirl and Superman on white vinyl. It was made in 1976 and was available for albums and singles. There are some beautiful vinyl cases from the 1950s-1960s like Teen Glo, Tune Toe and Rhythm Tote. These are all square in shape and are generally adorned with musical notes or two dating or dancing youths. You can pick up most of the cases above for about $10. Oddly, you can pick one up full of vintage .45s for just a little more. The latter comes highly reccomended by the author.